Manafort Surrenders To Federal Agents In New Phase Of Mueller Inquiry : The Two-Way Paul Manafort, who was President Trump's campaign chairman, and a longtime deputy are named in a 12-count indictment. They pleaded not guilty. Manafort's attorney called the allegations "ridiculous." 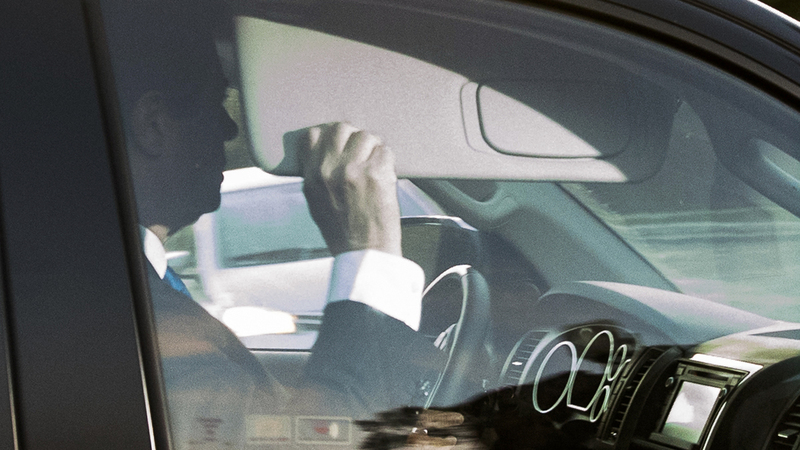 Former Trump campaign chairman Paul Manafort, seen here leaving his home in Alexandria, Va., early Monday, was reportedly told to report to an FBI field office. They were released after their hearing, with a $10 million unsecured bond for Manafort and a $5 million unsecured bond for Gates, NPR's Barbara Sprunt reports. A hearing has been scheduled for Nov. 2; meanwhile, the two men, who surrendered their passports to the FBI, must report to the court every day. Responding to news that Manafort was under indictment because of his financial dealings and work on behalf of Ukraine's government, President Trump said via Twitter, "Sorry, but this is years ago, before Paul Manafort was part of the Trump campaign." In what has become a familiar theme, the president added, "But why aren't Crooked Hillary & the Dems the focus????" Kevin Downing, Manafort's attorney, told reporters that his client's work with Ukraine was "seeking to further democracy" and called financial allegations in the indictment "ridiculous." Shortly after news of Manafort's indictment arrived Monday, the office of special counsel Robert Mueller said that a third figure in its investigation of Russia's involvement in U.S. politics, George Papadopoulos, had pleaded guilty to lying to FBI agents and acknowledged trying to get "dirt" on Hillary Clinton. Papadopoulos, 30, of Chicago, had been a foreign policy adviser to President Trump's campaign. The Department of Justice says he lied "about the timing, extent, and nature of his relationships and interactions with certain foreign nationals whom he understood to have close connections with senior Russian government officials." Manafort, 68, surrendered himself to federal law enforcement authorities on Monday morning, a Justice Department source tells NPR's Ryan Lucas, representing a new phase of the investigations into figures from Trump's inner circle. Both Manafort and Gates, 45, were indicted by a federal grand jury on Friday, according to a news release from Mueller's office. "The indictment contains 12 counts: conspiracy against the United States, conspiracy to launder money, unregistered agent of a foreign principal, false and misleading FARA statements, false statements, and seven counts of failure to file reports of foreign bank and financial accounts." The grand jury's indictment was unsealed on Monday morning, shortly after Manafort was seen entering an FBI field office. Manafort was taken into federal custody days after news emerged that a federal grand jury assembled by Mueller had voted to indict a figure in Mueller's investigation into possible coordination between Russia and people close to the Trump campaign in last year's presidential election. In addition to the main focus on Russia's efforts to tamper with the U.S. democratic process, Mueller's mandate also allows his team to probe any other criminal matters that arise during the course of its investigation. FBI agents raided Manafort's home in Alexandria, Va., over the summer; weeks earlier, he and Gates had registered with the U.S. government as foreign agents. Manafort resigned from the Trump campaign after revelations that he made more than $17 million in two years while working for the pro-Russia political party that once controlled Ukraine's government. If you need a recap of recent developments in the Russia investigations, NPR's Philip Ewing covers them here, discussing claims and counterclaims — such as word that the "Trump campaign data firm's guru tried to link up with WikiLeaks and that [Hillary] Clinton, DNC helped pay for infamous dossier on Trump." A previous version of this story misspelled George Papadopoulos' last name as Papadopolous.